High-throughput single-cell analysis is a challenging target for implementing advanced biomedical applications. An excellent candidate for this aim is label–free tomographic phase microscopy (TPM). We have reviewed some of the methods used to obtain TPM, analyzing advantages and disadvantages of each of them. 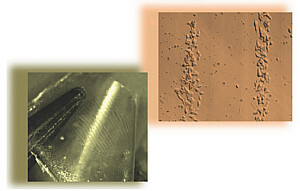 Moreover, an alternative tomographic technique is described for live cells analysis, and future trends of the method are foreseen. In particular, by exploiting random rolling of cells while they are flowing along a microfluidic channel, it is possible to obtain phase-contrast tomography thus obtaining complete retrieval of both 3D–position and orientation of rotating cells. Thus, a priori knowledge of such information is no longer needed. This approach extremely simplifies the optical system avoiding any mechanical/optical scanning of light source. The proof is given for different classes of bio–samples, red–blood–cells (RBCs) and diatom algae. Accurate characterization of each type of cells is reported and compared to that obtained by other tomographic techniques. Collective behavior in biological systems presents theoretical challenges beyond the borders of classical statistical physics. The lack of concepts such as scaling and renormalization is particularly problematic, as it forces us to negotiate details whose relevance is often hard to assess. In an attempt to improve this situation, we have presented experimental evidence of the emergence of dynamic scaling laws in natural swarms of midges. We found that spatio–temporal correlation functions in different swarms can be rescaled by using a single characteristic time, which grows with the correlation length with a dynamical critical exponent z ≈ 1, a value not found in any other standard statistical model. To check whether out–of–equilibrium effects may be responsible for this anomalous exponent, we run simulations of the simplest model of self–propelled particles and find z ≈ 2, suggesting that natural swarms belong to a novel dynamic universality class. 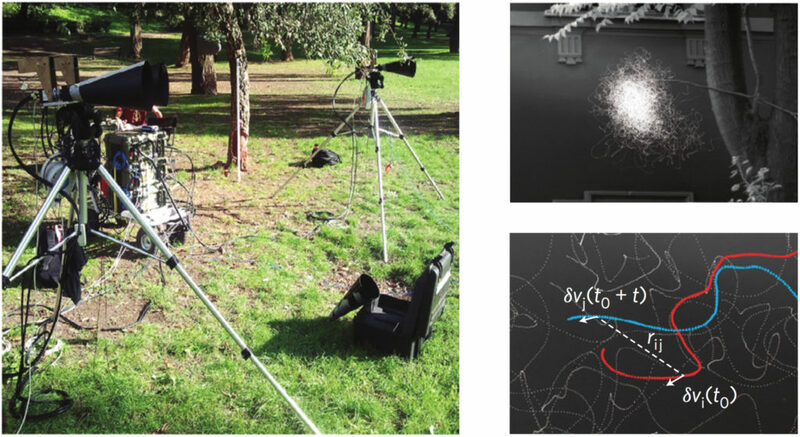 This conclusion is strengthened by experimental evidence of the presence of non–dissipative modes in the relaxation, indicating that previously overlooked inertial effects are needed to describe swarm dynamics. The absence of a purely dissipative regime suggests that natural swarms undergo a near–critical censorship of hydrodynamics. Electromechanical coupling through piezoelectric polymer chains allows the emission of organic molecules in active nanowires to be tuned. This effect is evidenced by highly bendable arrays of counter–ion dye–doped nanowires made of a poly(vinylidenefluoride) copolymer. A reversible redshift of the dye emission is found upon the application of dynamic stress during highly accurate bending experiments. By density functional theory calculations it is found that these photophysical properties are associated with mechanical stresses applied to electrostatically interacting molecular systems, namely to counter–ion–mediated states that involve light–emitting molecules as well as charged regions of piezoelectric polymer chains. These systems are an electrostatic class of supramolecular functional stress–sensitive units, which might impart new functionalities in hybrid molecular nanosystems and anisotropic nanostructures for sensing devices and soft robotics. Self–propelled particles, both biological and synthetic, are stably trapped by walls and develop high concentration peaks over bounding surfaces. In swimming bacteria, like E. coli, the physical mechanism behind wall entrapment is an intricate mixture of hydrodynamic and steric interactions with a strongly anisotropic character. 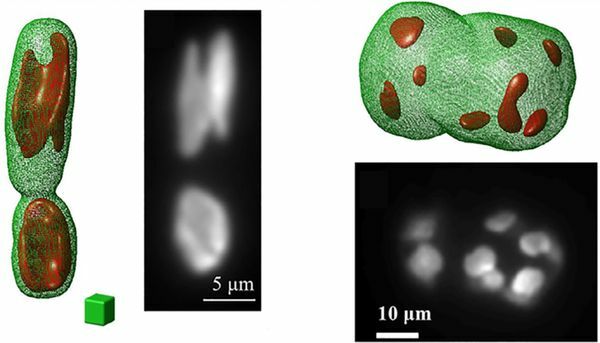 We have demonstrated that, by using a combination of three-axis holographic microscopy and optical tweezers, it is possible to obtain volumetric reconstructions of individual E. coli cells that are sequentially released at a controlled distance and angle from a flat solid wall. We have found that hydrodynamic couplings can slow down the cell before collision, but reorientation only occurs while the cell is in constant contact with the wall. In the trapped state, all cells swim with the average body axis pointing into the surface. The amplitude of this pitch angle is anticorrelated to the amplitude of wobbling, thus indicating that entrapment is dominated by near–field couplings between the cell body and the wall. 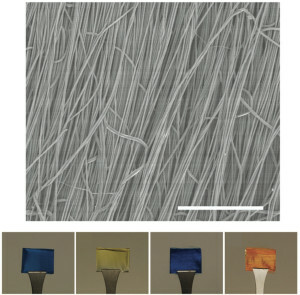 We have reported a voltage–free pyroelectrification (PE) process able to induce permanent and 2D patterned dipoles into polymer films, thus producing freestanding bipolar membranes. A single thermal stimulus triggers simultaneously the glass transition and the dipole orientation in the polymer. The technique is surprisingly easy to accomplish since the polymer solution is simply spin–coated onto a pyroelectric lithium niobate crystal that, during the thermal stimulus, generates spontaneously a surface charge density strong enough to orient the polymer dipoles. We have investigated complex optical networks containing one or more gain sections, and we have reported the evidence of lasing action; the emission spectrum reflects the topological disorder induced by the connections. A theoretical description compares well with the measurements, mapping the networks to directed graphs and showing the analogies with the problem of quantum chaos on graphs. We have shown that the interplay of chaotic diffusion and amplification leads to an emission statistic with characteristic heavy tails: for different topologies, we have provided an unprecedented experimental demonstration of Lévy statistics, expected for random lasers, for a continuous–wave pumped system. We have introduced a novel dynamical inference technique, based on the principle of maximum entropy, which accommodates network rearrangements and overcomes the problem of slow experimental sampling rates. We have used this method to infer the strength and range of alignment forces from data of starling flocks. We have found that local bird alignment occurs on a much faster timescale than neighbour rearrangement. Accordingly, equilibrium inference, which assumes a fixed interaction network, gives results consistent with dynamical inference. We conclude that bird orientations are in a state of local quasi–equilibrium over the interaction length scale, providing firm ground for the applicability of statistical physics in certain active systems. 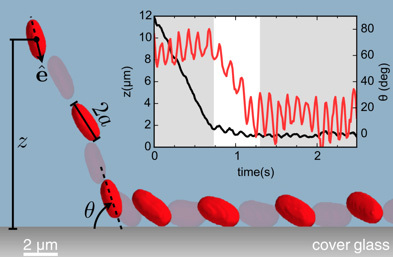 We have shown that a suspended red blood cell (RBC) behaves as an adaptive liquid–lens at microscale, thus demonstrating its imaging capability and tunable focal length. In fact, thanks to the intrinsic elastic properties, the RBC can swell up from disk volume of 90 fl up to a sphere reaching 150 fl, varying focal length from negative to positive values. These live optofluidic lenses can be fully controlled by triggering the liquid buffer’s chemistry. Real–time accurate measurement of tunable focus capability of RBCs is reported through dynamic wavefront characterization, showing agreement with numerical modelling. Moreover, in analogy to adaptive optics testing, blood diagnosis is demonstrated by screening abnormal cells through focal–spot analysis applied to an RBC ensemble as a microlens array. 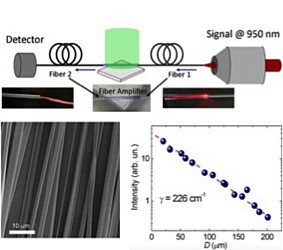 We have reported on near–infrared polymer fiber amplifiers working over a band of about 20 nm. The fibers are cheap, spun with a process entirely carried out at room temperature, and shown to have amplified spontaneous emission with good gain coefficients and low levels of optical losses (a few cm–1). The amplification process is favored by high fiber quality and low self–absorption. The found performance metrics appear to be suitable for short–distance operations, and the large variety of commercially available doping dyes might allow for effective multi–wavelength operations by electrospun amplified fiber optics.